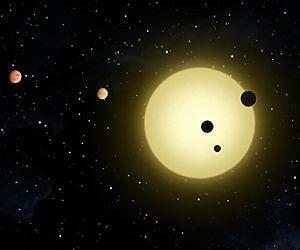 Coming less than a year after the announcement of the first circumbinary planet, Kepler-16b, NASA's Kepler mission has discovered multiple transiting planets orbiting two suns for the first time. This system, known as a circumbinary planetary system, is 4,900 light-years from Earth in the constellation Cygnus. The planets Kepler-47b and Kepler-47c: Kepler-47b has three times the radius of earth and orbits the pair of stars in less than 50 days while Kepler-47c is thought to be a gaseous giant, slightly larger than Neptune with an orbital period of 303 days. Credit: NASA/JPL-Caltech/T. Pyle. For a larger version of this image please go here.